Fast, reliable internet service has become essential for everything from getting news to finding a job. But 24% of rural adults say access to high-speed internet is a major problem in their local community, according to a Pew Research Center survey conducted earlier this year. 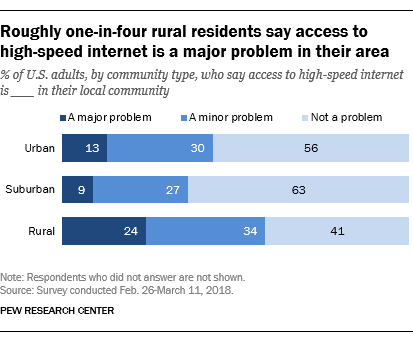 An additional 34% of rural residents see this as a minor problem, meaning that roughly six-in-ten rural Americans (58%) believe access to high speed internet is a problem in their area. Concerns about access to high-speed internet are shared by rural residents from various economic backgrounds. For example, 20% of rural adults whose household income is less than $30,000 a year say access to high speed internet is a major problem, but so do 23% of rural residents living in households earning $75,000 or more annually. These sentiments are also similar between rural adults who have a bachelor’s or advanced degree and those with lower levels of educational attainment. For years, policymakers and advocates have looked to address broadband-related gaps between rural and non-rural communities in subscriptions, infrastructure, performance and competition. 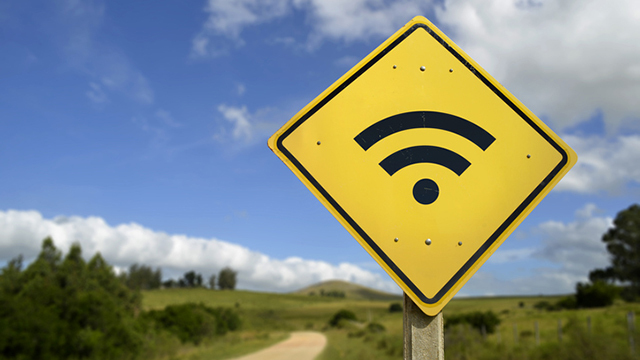 Data from the Federal Communications Commission show that rural areas are less likely to be wired for broadband services and tend to have slower internet speeds compared with other areas of the country. There are also fewer broadband providers operating in rural areas, which means consumers tend to have limited options when subscribing to high-speed services. And while the broadband gap between rural and non-rural Americans has narrowed over time, rural adults remain less likely to have a high-speed internet connection at home. Seven-in-ten suburban residents and two-thirds of urban dwellers say they subscribe to broadband services at home, compared with 58% of rural adults, according to a separate Pew Research Center survey conducted in January. Beyond lower home broadband adoption rates, adults in rural areas also are less likely to own mobile devices or to use the internet. 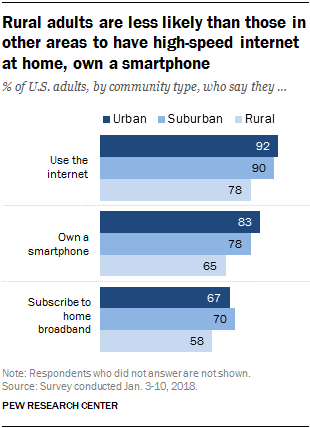 While around two-thirds of rural Americans have a smartphone, those shares rise to around eight-in-ten among those living in cities (83%) or the suburbs (78%), according to Center data. At the same time, some rural Americans do not use the internet in any capacity: 22% of adults living in a rural area say they never go online, a share that is more than double that among urban or suburban residents.